Hi Lovelies! Recently I dyed my hair again. & before that was somewhat a long process of deciding what style and color dye my hair with. As you know there is the ombre trend going on & I keep thinking if I should do it. But the thought of having most of my hair black again was not so pleasing... n if I do an ombre start off with another color than black, it would mean I still have to upkeep the hair color frequently. so I thought I go with the full color instead. ( & I will think about ombre later on...) I was torn between purple and red because I really want to dye my hair purple but I think there is less room in purple for a hair color that I really want. 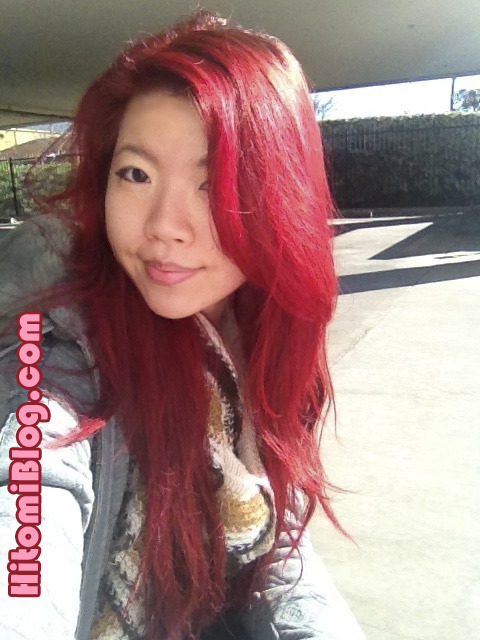 At the end I decided with Red color, & this time I want it really red! ( not those... reddish brown stuff that fades in a wash and then just left with brown type of dye!) 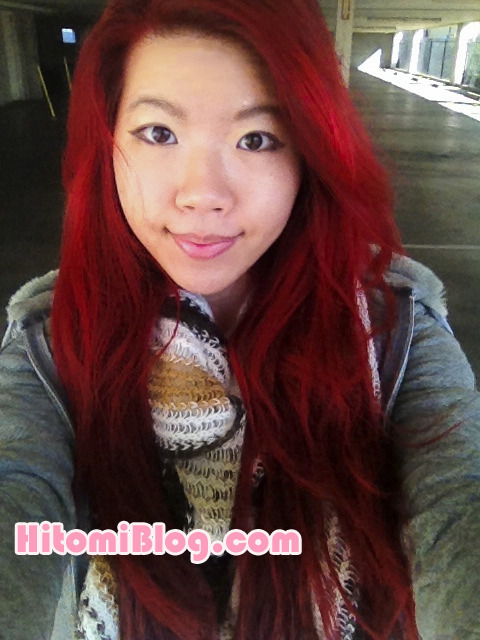 ~~ Here is my process of getting my red hair..! Loreal High Color Highlights, in RED. I always purchase 2 tubes because I cannot understand how people with long hair can possibly dye their hair with just a tube. It is simply not enough product for me. Although secretly I hope I only need 1 so I can save money! You will need developer with the cream. I got the 40 Volume. I start off with the mid section of my hair because dyed hair are usually less likely to take in color, the middle section is a little bit darker than the rest. The root is of course the darkest for me but it will take in color better because it is virgin hair. After applying the middle section, apply the rest, and roots are last. The box of the cream says 30 minutes but I left it on for an hour. Out door, Not under direct sunlight. Out door, under direct sunlight. Overall I think I am pretty satisfied with the result. It’s not completely evened color. I blame myself for doing it in the middle of the night, I was kind of tired and did not apply the dye very carefully. 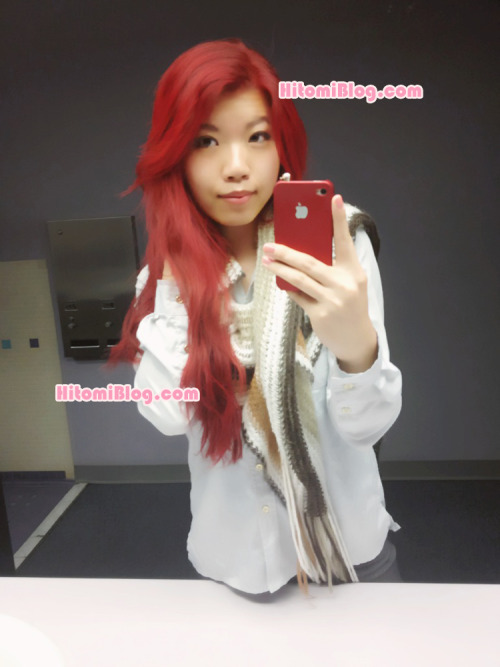 Because I dyed my hair before, the lightest color turned into the lightest of reds on my hair. If I were to do this again, I would not leave that much of my root untouched in the first section of application. Reason being that even though root takes in color easier, but it is only at about 1/2 inch to an inch of hair at the root. I still don’t want to start off with the very ends of the root since this hair dye is made for black hair so it shouldn’t take too long for the hair to take in color. It is better to have somewhat a gradient from dark to light then: light, dark light... that would be horrible. In my pictures you probably can’t really see any gradient, the color difference is not that obvious in real life and it’s like a little different tones of red, so it still looks pretty ok. I think it’s a success, although of course could be better, my journey of learning to DIY hair dye is still progressing! 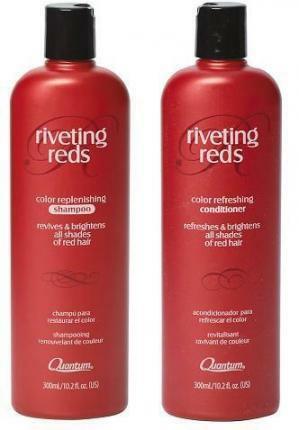 At the end, remember to also get red shampoo and conditioner to upkeep your red hair so it doesn’t fade super fast! Also, don’t try to mix regular shampoos with the red shampoo. 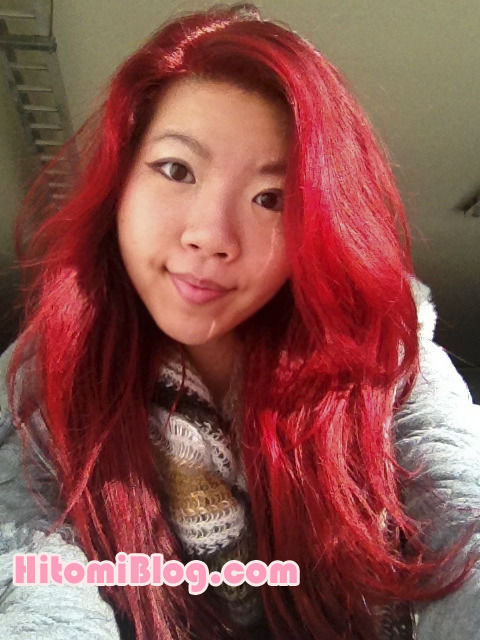 I tried that once and totally regret it, I think my red hair faded a lot more that way! I hope you like my tips and tutorial video. Please subscribe to my youtube channel for more beauty, product reviews + DIY tutorials! ( because I don’t always have a complimentary blog post along with my youtube videos)..
Are you planning to dye your hair red? What other hair colors do you think I should attempt in future?